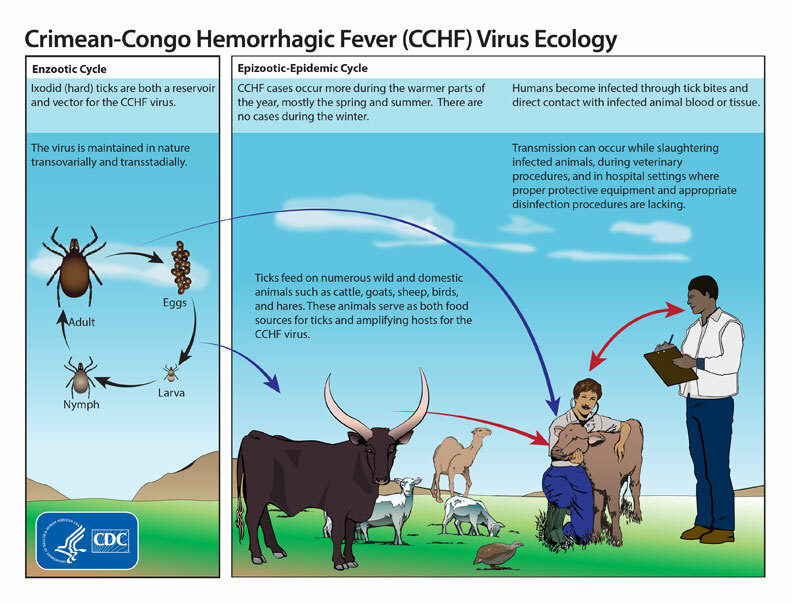 Crimean-Congo hemorrhagic fever virus: a serious, oftentimes deadly pathogen. Humans infected with this virus develop non-specific febrile symptoms and then progress into a hemorrhagic phase where they can exhibit uncontrolled bleeding before succumbing to the disease. Case fatality rates can be as high as 30%. Research with this virus requires the highest levels of biocontainment: biosafety level 4 (BSL-4). While maybe not as well-known as Ebola or Lassa virus, Crimean-Congo hemorrhagic fever virus (CCHFV) is the most widely distributed hemorrhagic fever virus and is found in Africa, Eastern Europe, the Middle East and Asia. The principal vector, Hyalomma ticks, can directly infect humans during feeding or infect livestock that can transmit the virus to humans during butchering; human-to-human transmission, mainly during care of infected patients, can occur as well. Interestingly, humans are the only naturally infected species known to exhibit overt disease when infected with CCHFV. Despite the wide-distribution and serious disease caused by CCHFV, we currently understand little about the pathogenesis of CCHFV. Basic questions remain unanswered. How does CCHFV spread from the site of infection? What are the host sensors that first detect the invading virus? What innate immune responses control the virus? How does the adaptive immune system get in the game to control the virus? How does the virus counteract all these responses to cause disease? Why do some people recover when others succumb? Why do some people never show symptoms at all? Why do humans seem to be uniquely afflicted with serious disease following infection with CCHFV? As scientists we often turn to animal models to study how pathogens cause disease in the host. Mouse models of CCHFV are currently limited to mice deficient in the type I interferon system, a crucial aspect of the innate immune response, limiting what questions we can answer with these mice. This is where crab-eating, also known as cynomolgus, macaques step in. In our paper we report that cynomolgus macaques infected with CCHFV develop many of the hallmarks of CCHFV-induced disease seen in humans including severe, lethal infections, severe but recoverable infections and even asymptomatic infections. This model will provide a tool to study nearly all aspects of CCHFV pathogenesis from asymptomatic to serious infections in an immunocompetent animal model. Cynomolgus and related rhesus macaques serve as models for a variety of serious human pathogens such as Ebola and Lassa so attempting to model CCHFV in macaques is not a stretch. But we are not the first to attempt to infect macaques with CCHFV and previous attempts have all reported little to no disease following infection of macaques. What did we do differently? It may all come down to the strain of CCHFV. Many previous attempts have used the prototypical strain of CCHFV, strain 10200 which has been passaged extensively in the brains of mice. We used a strain isolated from a fatal human infection called strain Hoti. Did we get lucky by using strain Hoti? Perhaps. CCHFV as a virus has substantial genetic diversity. Strain Hoti and 10200 differ by up to 15% of amino acids encoded by their segmented genomes. Likely within this diversity are undiscovered virulence factors that may make certain strains of CCHFV more pathogenic, in animal models and humans, than others. Extensive passaging of strain 10200 in mice may have adapted the virus to mice at the expense of virulence in humans or primates. Even within our model there remain questions to be answered. Why does the route of inoculation determine disease severity? Why do some macaques get sick and recover when others succumb? What host immune responses control the infection? Although much work remains to be done for CCHFV, it is a promising time for research into CCHFV and our macaque model adds to the growing scientific tool-set to study CCHFV. Recent advances in reverse genetics for CCHFV will allow scientists to pick apart in fine detail how CCHFV functions. Recombinant strains of CCHFV expressing reporter proteins will let scientists track how CCHFV spreads within the host at the cellular level. Techniques for studying ticks and tick-delivered infections under BSL-4 conditions are being developed. Novel vaccines and antivirals are making progress in mouse models foretelling a future in which CCHFV infections may be prevented or controlled. Our macaque model will provide an important tool for translating all this research into novel treatments for CCHFV-infected humans.